Berlin, Germany, 3 October 2005 - His Highness the Aga Khan, Imam (spiritual leader) of the Ismaili Muslims and founder of the Aga Khan Development Network (AKDN), was today awarded the Die Quadriga prize in recognition of his life’s work in helping people in the poorest regions of the world. At a ceremony held in Berlin’s renowned opera house, the Komische Oper, Hamid Karzai, President of the Islamic Republic of Afghanistan, and a previous Die Quadriga recipient, delivered the laudatory address as he presented the “United We Care” award to the Aga Khan, praising him as a humanist, peace-builder, democrat, philanthropist and “esteemed ambassador between civilisations”. Tanzanian President Benjamin Mkapa described the Aga Khan as “a leader in helping to bring hope and opportunity to regions of the world that have known too much despair”. The 25,000 Euro gift which accompanies the Die Quadriga award was matched by the Aga Khan and subsequently allocated to a microfinance project in Tanzania. President Mkapa thanked the Aga Khan for the gift and said that His Highness had long recognised the importance of microfinance in “harnessing the energy and the ingenuity of individual entrepreneurs”. 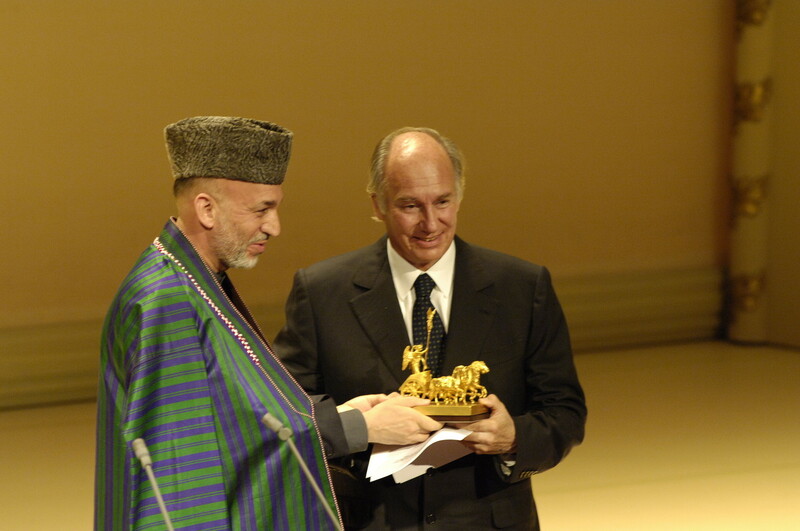 In accepting the Die Quadriga award, the Aga Khan praised President Karzai as a man who is “an inspiration to the Afghan people as they reclaim their proud nationhood and struggle to build a future of promise” and thanked President Mkapa for “exemplary leadership for your people’s fight against poverty and their commitment to peace and harmony, at home and within the region”. The Aga Khan praised the Ismaili community as well as the many other volunteers and institutional and individual collaborators for the success of the AKDN. The Die Quadriga awards are presented every year on the day of German Unification. The Awards honour personalities from the political, economic and cultural dimensions of life who have shown vision, courage and responsibility. The Awards also recognise people who exhibit far-sightedness, pragmatism, a pioneering spirit and the power of conviction. Other Die Quadriga 2005 award winners were Dr. Helmut Kohl, former Chancellor of Germany; Sir Timothy Berners-Lee, the creator of the World Wide Web; and Paula Arnold, Catherine McCartney, Claire McCartney, Donna McCartney, Gemma McMahon and Bridgeen Hagans, five sisters renowned for their civil courage in campaigning for justice after their brother was murdered in Belfast by the IRA. The Aga Khan is the 49th hereditary Imam (spiritual leader) of the Ismaili Muslims and a direct descendant of the Prophet Muhammad (peace be upon him). A Harvard graduate in Islamic history, the Aga Khan succeeded his grandfather as Imam of the Ismailis in 1957. He is the founder of the Aga Khan Development Network. The Aga Khan Development Network (AKDN) is a group of private, non-denominational development agencies whose mandates range from the fields of health and education to architecture, culture, rural development and the promotion of private-sector enterprise. Its agencies and institutions, working in over 30 countries, seek to empower communities and individuals, often in disadvantaged circumstances, to improve living conditions and opportunities, especially in countries in sub-Saharan Africa, South and Central Asia and the Middle East.